Once again, I'm going to disappoint frustrated Google searches by title posts with my favorite searches that bring people to Dear Outer Space. This one kind of makes me want to have a frame old circus ad in my writing room. I'm writing, but I'm not in my writing room. I'm on the couch in the adjacent living room surrounded by the chaos of 10 different projects. Classes, editing, taxes, oh my! I like being busy. Prefer it, in fact. Especially when I'm not busy, like now. The job search hasn't been that successful in the short term. However, I have good news for the long term. Before I tell you the good news, here is a helpful guide to all the acronyms in this post. 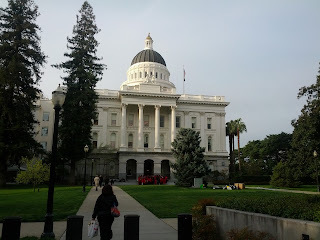 Sunday afternoon I drove north to Sacramento, California's state capitol. Did you know it was north? Because I sure didn't and was very surprised when Google maps told me otherwise. Super easy drive. I was heading to the California Poetry Out Loud Statewide Competition. The first round was on Sunday night and, I have to say, impressed doesn't fully explain my feelings. These 33 high school students were all individually so accomplished. As a whole, they could take over the world with their wide-ranging interests spanning from math to writing to athletics to business to politics to drama and back again. On Monday morning they were on fire. The second round took place in the state Senate Chambers and most students were visited by their state reps. These kids really brought it on Monday. Sadly, only six were finalists and all were worthy of winning. Gentlemen swept the first and second runners up, as well as the State Champion. I can't wait to see how he does in Washington D.C. I wish I could attend. While there, I saw friends from around the state, CPITS teachers who coached their county's champion. I also heard a lovely speech by Dana Gioia and almost got to meet Juan Felipe Herrera, California's recently-named Poet Laureate, who was one of the judges. 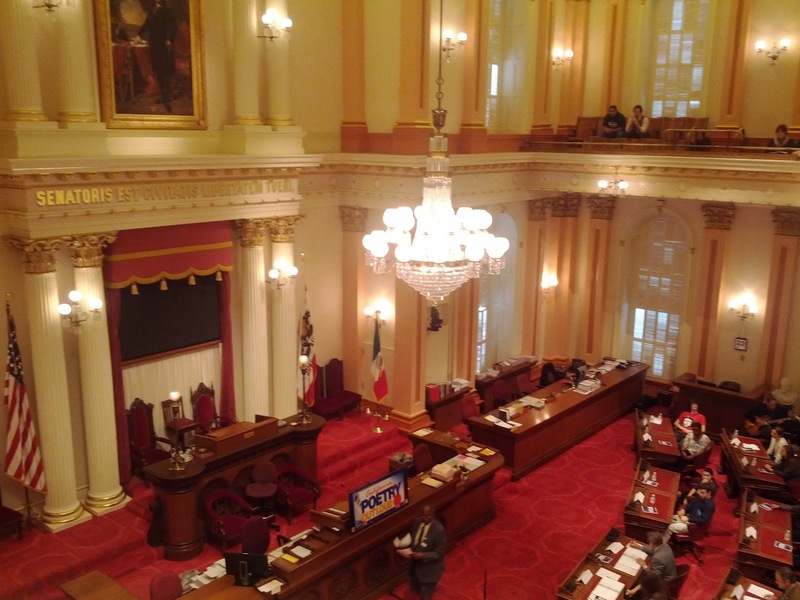 CA State Senate - talk about an intimidating room! As things were coming to a close, I was speaking with the CPITS Administrative Coordinator, Tina, saying I'd love to be involved with PoL (which CPITS manages in some counties including San Francisco). She told me she already put me down to be the Poetry Out Loud Coordinator for San Francisco City & County! This program is funded completely through grants from the NEA and corporate sponsors. I can provide five sessions to a local school completely free of cost to them. Since only one school participated from San Francisco this year, I hope we see at least a 500% increase next year! I've already made a spreadsheet (man, I love those things) of all the area high schools including public, charter, private, religious and independent. There are a TON of schools here. I'm really hoping to form some connections with schools and get kids involved with and passionate about poetry. So it turns out there is hope for this freelancing thing still. If only the school year wasn't ending already. My work with PIO will finish at the end of May so I'm considering getting a no-brainer summer job, either admin work or retail working at Anthropologie. Might as well get an awesome discount, right?